I used to think that spring is the season when Puglia is at its best. The air, though still slightly brisk from the last gasps of winter, is somehow sweeter. The sun feels warm on the skin. The fields host a riot of new growth with a hundred shades of green manifest in every new leaf and stalk. But now we’re moving from summer languor to autumn abundance. The markets are bursting with an end-of summer avalanche of tomatoes, eggplant, peppers, melons and sweet, plump pale green grapes. In terms of beauty, autumn in the Valle d’Itria is giving spring a run for its money. And then there are the figs. Ficus carica ‘Panachee’ or fico rigato in Italy, this fig is as stunning to look at as it is to eat. At this time of year, fig trees dotted throughout the countryside here are almost doubled over with their bountiful loads. They drape conveniently over stone walls and into the streets, so we find it necessary to stop (repeatedly) on our bikes to sample them. The figs are hot from the sun and fairly bursting at the seams, revealing their deep scarlet flesh with almost no encouragement. If we manage, we bring them home in our bike panniers. We’ve also been madly harvesting figs from the trees that are scattered throughout our olive grove, discovering new strategies to prolong their useful lives well into the winter. 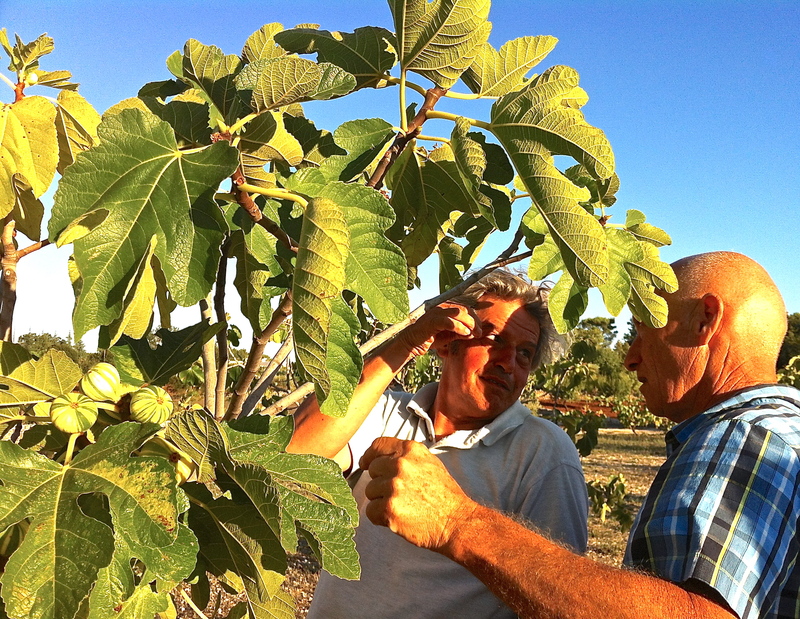 Paolo Belloni and Brian Faris examine fig trees and discuss pruning strategies at I Giardini di Pomona. Since we are now drowning in figs, we thought we might learn more about them by visiting what is truly one of the most extraordinary local treasures anywhere. On a recent bike ride, we came upon I Giardini di Pomona, a conservatory just outside the Valle d’Itria town of Cisternino dedicated to preserving and propagating ancient and heirloom fruit trees with a particular focus on figs. Over three hundred types of figs. Figs with widely different flavor profiles, skin types, shapes, seasonality and provenance. Figs that make you feel as though you have arrived in the Garden of Eden and there aren’t any serpents anywhere. Martine’s Pugliese pottery is both simple and elegant. 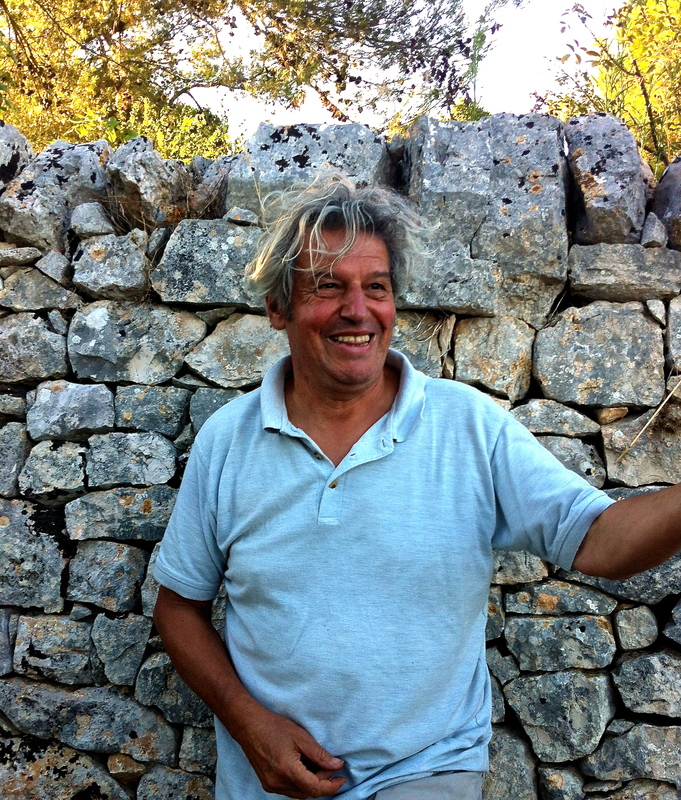 The founders and hosts, Paolo Belloni and Martine Balanza, chose this site in the dead center of the Valle d’Itria over nine years ago to continue the botanical conservation work they started in Milan. They are committed to the promotion of biodiversity through the propagation of rare, often nearly extinct fruit tree varietals. They’re also deeply committed to education, offering school visits to their orchards to provide hands-on, experiential learning to new generations in the hope that these lessons get traction in a world that seems oddly bent on limiting our options by reducing biodiversity. Cuttings and starts of these hard-to-find varietals are for sale at the garden; you can also take home your new plants in beautiful terracotta pots Martine has commissioned from nearby pottery studios. 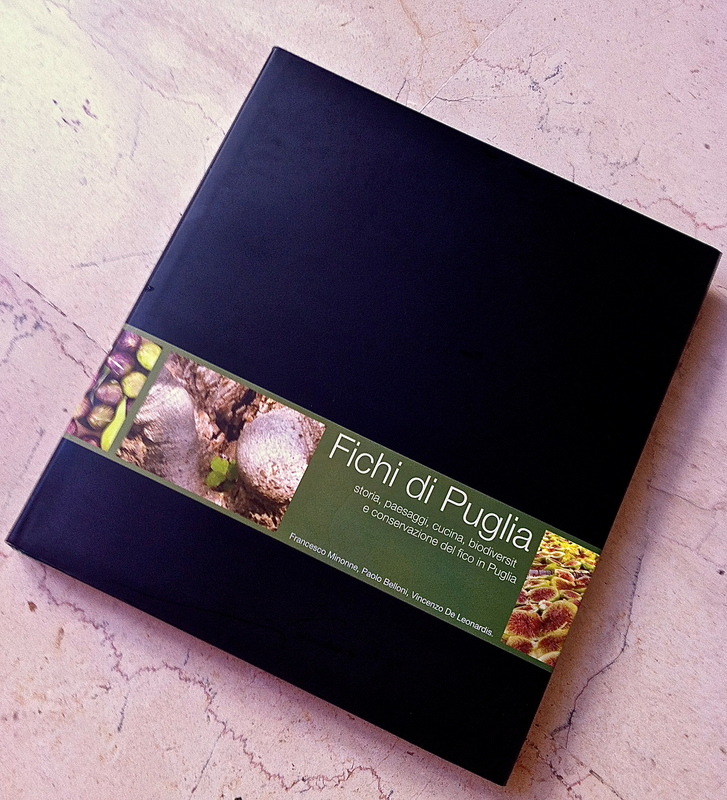 And Paolo has produced an absolutely gorgeous book, Fichi di Puglia, focused exclusively on the role of figs in history, culinary culture and the botanical world. Paolo Belloni of I Giardini di Pomona leads us through his collection of over 300 common and hard-to-find fig cultivars. We joined Paolo for a walk through his giardini (gardens) yesterday, trying desperately to create a taste memory for each new fig varietal we managed to eat. Since every successive fig tasted better than the one before it, we were hopeless at our task. As the sun slowly set in the early autumnal Mediterranean sky, we wandered through orchards interplanted with culinary and medicinal herbs and bordered by traditional Pugliese stone walls draped with the macchia Mediterranea (native Mediterranean flora) for which this region is known. The horizon was streaked with crimson and the breeze rustled the broad fig leaves against the trees’ gnarled trunks. The only sounds were the birds and a faraway tractor rattling through a field on its way back to the farmhouse. 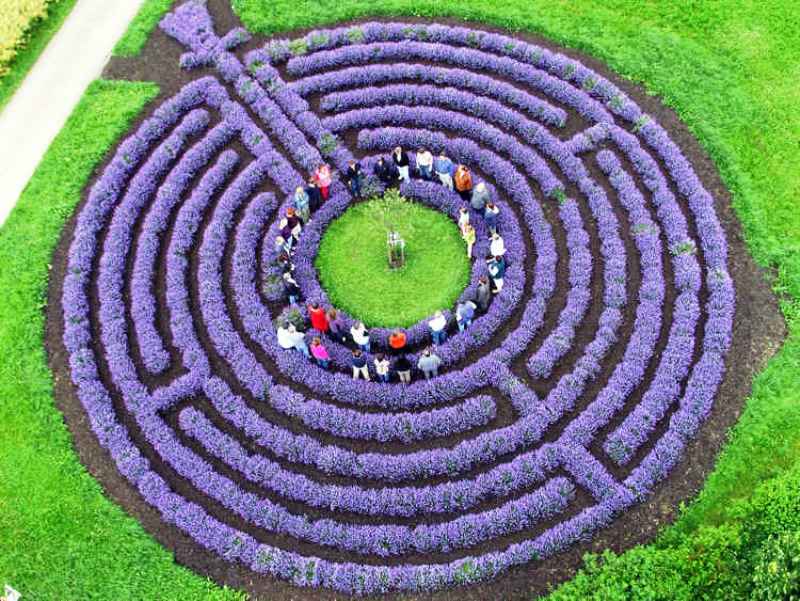 Paolo Belloni has planted a lavender labyrinth with a persimmon tree from Nagasaki, Japan. Incredibly enough, this variety survived the World War II atomic bomb that devastated the city (Photo credit: http://www.blog.apulya.com). We’re told that many of Puglia’s senior citizens think of figs as the visual representation of a poverty they’ve long left behind. After all, during the hungriest years of World War II to the even leaner post-war years, figs grew abundantly in the hills and valleys here. When there was precious little to eat, both freshly picked and sun-dried figs provided sweetness and calories all year long. Maybe that’s why Paolo and Martine’s work at the botanical conservatory, with its mission to increase varietal diversity using traditional, organic cultivation techniques, is not always well understood locally. Yet their impact is international, with ties to botanists all over the world. Their gardens represent the very best hope for local tourism that is sustainable, attracting new visitors to the Valle d’Itria year round who share their vision for a more humane future. Paolo Belloni’s book, “Figs of Puglia,” is a visual treat full of more fig lore than you can possibly imagine. 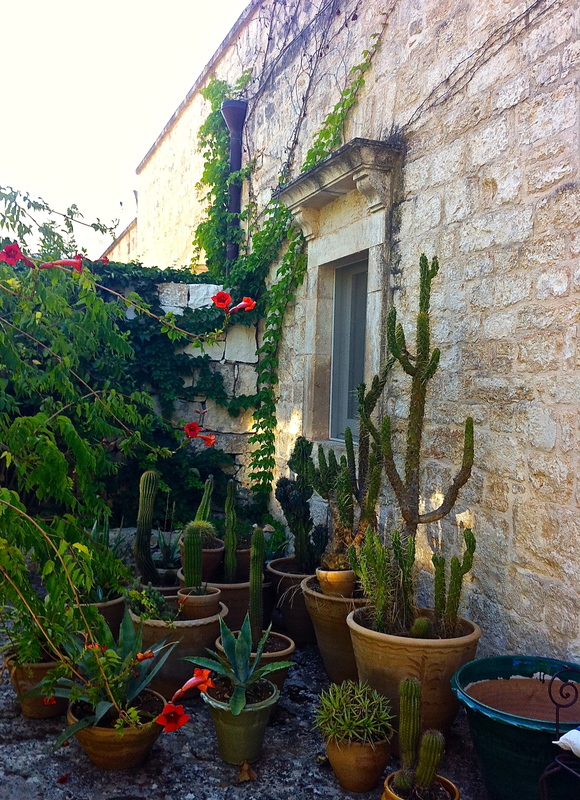 Make sure you include I Giardini di Pomona on your Puglia itinerary when you visit. And if it happens to coincide with the height of the fig harvest, consider yourself doubly blessed. If Puglia isn’t on your immediate travel horizon, why not try some of Paolo and Martine’s fig-based recipes from your own early autumn bounty? From the simplest fig “chips” to an especially satisfying fig and almond cake, you’ll be transported to the fig orchard the minute you take a bite. 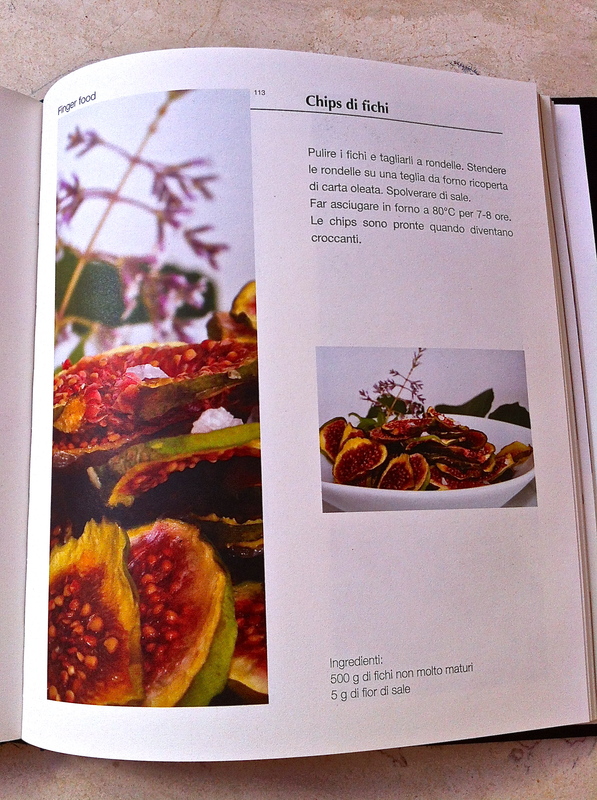 Fig chips recipe in Italian in Paolo Belloni’s “Figs of Puglia” book. For the fig chips, choose figs that aren’t especially mature. Wash them and cut them into slices from top (stem end) to bottom. Place them on a baking sheet that has been covered with parchment. Salt them with fleur de sel and dry them in an oven set at about 175 degrees Fahrenheit for 7-8 hours. They are ready when they are nice and crispy—delightful with an aperitivo during the late summer/early autumn sunset. For the cake, use this recipe from the New York Times. You can substitute the butter with extra virgin olive (3 Tbsp. of olive oil instead of 4 Tbsp. of butter; grease the pan with olive oil, too). Gorgeous fig and almond cake from the New York Times (Photo credit: Karsten Morgan for the NY Times). You might also visit Domenica Marchetti’s blog for a terrific confettura di fichi (fig jam) recipe. Authentic and addictive in one fell swoop. Finally, Rachel Roddy, a particularly evocative food writer based in Rome, offers this recipe for a fig tart from London’s River Cafe. There’s no shortage of great things to do with figs. Or you could just eat them, one after another, like we do, ever grateful for the 300-plus varieties cultivated just down the road at I Giardini di Pomona. 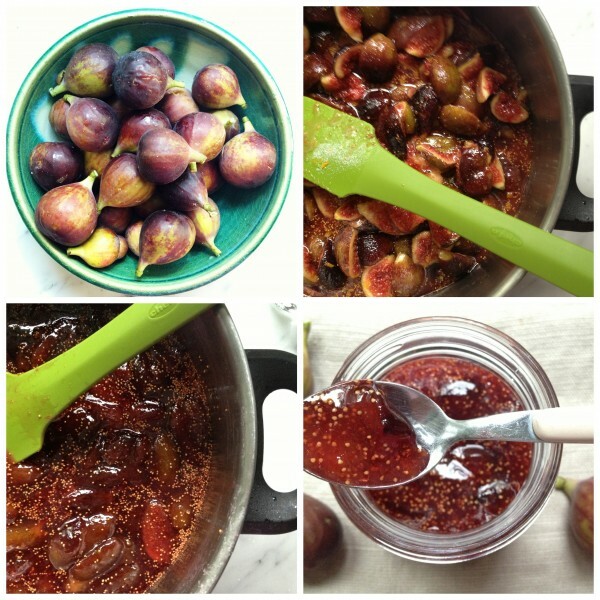 Deeply flavorful fig jam from cookbook author Domenica Marchetti (Photo credit: http://www.domenicacooks.com). I love figs!! I am hoping there will still be some on our Vergemoli trees when I get there in a few weeks. Rachel, I loved your post. It brought back (fond?) memories of being on the receiving end of so many disapproving stares while we attempted to forage with our children in tow. Oh, the fish-eyed stares directed our way, rivaling only the disapproval for our scantily-clad children (no scarves in September). You’d love Paolo and Martine, not to mention all those figs. I love each and every one of your posts–thank you for the kind words about mine. This sounds like heaven to me. We wait all year for our figs but after two weeks they are gone. Yes, I want to visit I Giardini di Pamona! Laura, I think you need to add at least one more day to your Puglia itinerary! Very interesting. We have been enjoying Trader Joe’s figs. They seem especially good this year. Do you know where can we purchase a greater variety of choices than just black and green here in the states? We may have to stop reading your blog as it makes us want to visit Itria and we think at 94 and 89 we are past enduring the rigors of travel. 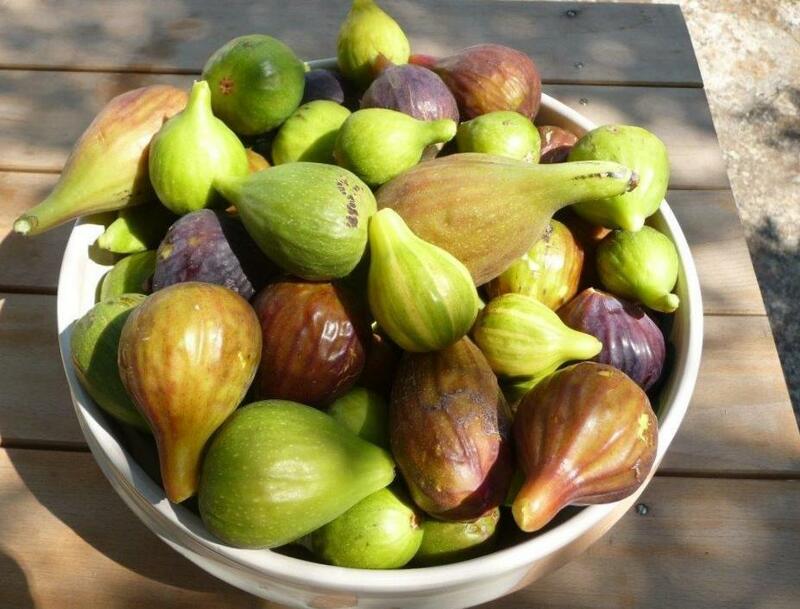 Jim and Paula, we have learned that there are seemingly infinite varieties of figs. Brian has identified a Lebanese man in the U.S. who is cultivating heirloom varietals, so I will ask him to share what he has learned with you. And as for travel, it’s not too late! All those great wheel chair escorts in the airports . . . . We’d love to see you here again! But don’t stop reading the blog. Catherine in the past few days, I have eaten such perfect, warm figs from my very own, very small tree in my back yard. This tree amazes me as I planted it just last year in a container and then transplanted it into the soil in my small back yard just recently. This tree is a warrior — it’s only about 4′ tall and yet it yields the most perfect, gorgeous, yummy fruit. I wish I could remember the variety to share with you however it was grown locally to survive our Ashland winters. 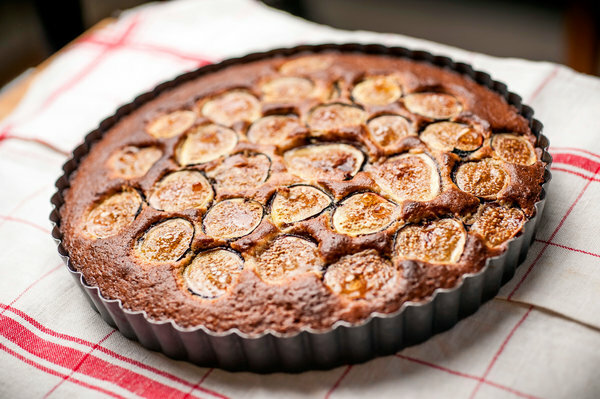 The fig tart you share sounds delish and I intend to spoil myself with just such a tart. 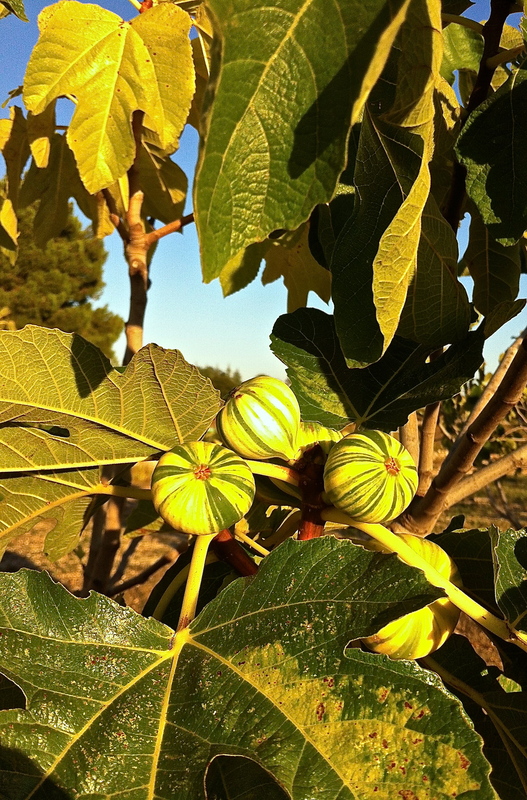 Hi Jan–When we were at I Giardini di Pomona, we were bowled over by the resilience of figs. They really do seem to want to thrive, particularly in especially warm weather (Ashland, anyone?). Are your figs the green or dark purple variety? When we were tasting figs, we were intrigued that there were so many nuanced flavors available in figs. Beyond the jammy sweetness, there were figs with an almost cinnamon-y notes. Others had a more elevated acidity, which offered a relief from the deep, dark sugary profiles. We absolutely loved the experience and are now trying to learn everything we can about the world of figs. Tell me if you like the recipes . . .
I’ve been making an olive tapenade with fresh figs inspired by a recipe I saw on Saveur’s website. Roughly equal amounts of oil-cured olives (pitted, natch) and fresh figs, add anchovies & salt-packed Pantellerian capers, chopped garlic, lemon juice & zest, extra virgin olive oil, blitz in the processor. Oh my God, Jim. What a gorgeous recipe. We are so ready for something savory with these figs, so this tapenade has just moved to the top of the rotation. Thanks for sharing!